It’s been a damn long time since I got sucked into a racing game that didn’t have Mario Kart in the title. Onrush, an inventive new racer from veterans of Sony’s MotorStorm series, is making a decent go at it, though. With a focus on nothing but speed and mayhem on tracks that have no real beginning or end, it’s a racing game that isn’t at all about racing. The better comparison might actually be something like Overwatch, a first-person shooter where killing isn’t as important as playing as a team to achieve some other goal. Similarly, in Onrush, you’re not trying to do everything you can to weave your way into first place. There are no standings or laps or finish lines at all, actually. Instead, you’re teaming up with a handful of other racers, each picking from a number of vehicle classes of different sizes and utilities, to outscore your opponents in a few different high-speed events. One is purely about doing tricks—flying off ramps, crashing through tiny “fodder” vehicles that populate the track, etc.—to build up your speed-boost meter and burn through it for points. Another is all about running opponents off the road, awarding victory to the team with the last person standing. The two best modes, though, ingeniously funnel all the players toward the same confined spaces, whether they be an unending series of narrow checkpoints you’re all trying to hit or a moving king of the hill-style zone both teams are fighting to capture. These game types purposefully corral all the players and the tiny AI fodder cars into one giant roving mass of explosions and death, with cars flying between the tracks’ wide, multitiered pathways and all slamming together like the unfortunate Hot Wheels collection of an especially violent little kid. If you fall too far behind the pack, dully thrumming along while all the action keeps pulling farther away, the game will mercifully lift you up and teleport you back into the thick of it. It knows chaos and speed is what you’re here for, and it’s very willing to give it to you. My biggest issue with the game, though, is its inconsistency. I’ve played for several hours already and I still don’t have a handle on what kind of collision I can shrug off and what’ll wreck my car in an instant. One second I’ll be battering an opponent and leaving little more than a scratch; the next, I’m turned into a tumbling heap after my back tire grazes a decrepit big rig that’s in the middle of the track for no reason. Those illogical crashes happen constantly, and they never start to feel any less irritating, especially because wiping out takes you out of the action for several seconds that feel like an eternity. The waiting is essential to the way the game is designed—every second you’re not on the track, you’re not contributing to your team’s score, and failure, whether by your own hand or an enemy’s, should come with some sort of punishment—but when they’re so often the result of wrecking after barely making contact with a jutting corner of some unforeseeable obstacle, those several seconds are just the perfect amount of time for you to sit and stew over just how unfair it all feels. But then a few seconds later, you’re back in the game, caught up in all the beautiful chaos and forgetting about those slights. 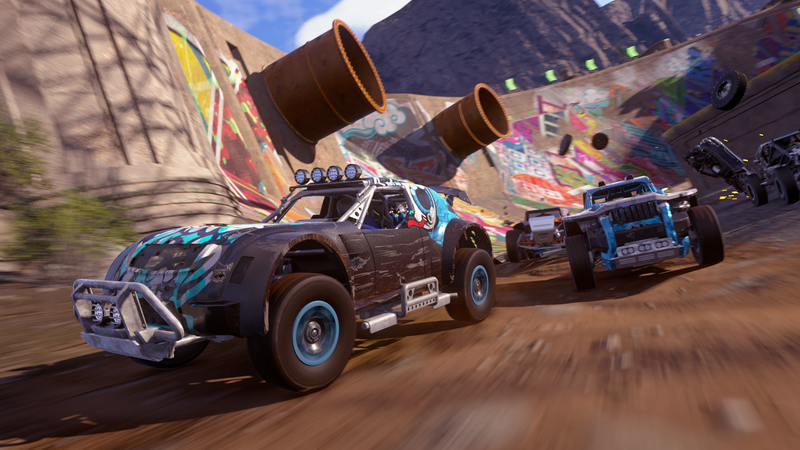 The thing about Onrush that might be a bigger sticking point for most people is the price tag. For a game that’s not much more than a skeleton of four multiplayer modes tied together by a relatively generous but too-familiar drip feed of experience points and loot boxes, it’s a pretty big ask at $60. Going back to the Overwatch comparison, Blizzard’s hit was asking players to invest in a similarly slight package, but it proved to have enough polish, tactical depth, and character variety to keep it feeling fresh even after dozens of hours. Onrush has a novel, fun core, but as far as I can tell, there’s not enough going on under the hood—no real need for synergy between car classes, barely any opportunities for teamwork, the slightest bit of strategy to picking classes and timing the deployment of your ultimate ability—to warrant sticking around, let alone plunking down that much cash.